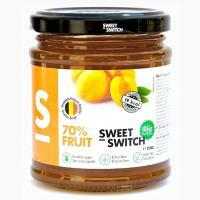 Apricot spread, sweetened with stevia extract (and conaining a small portion of fruit sugar). 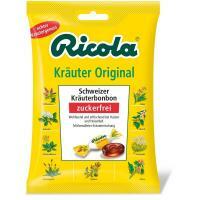 Has only <b>99 calories</b> per 100 grammes. Apricot: 70%. In our online store you can find numerous liquid stevia products - some of them in natural state, others combined with extracts like vanilla, chocolate, coconut or lemon. Liquid stevia is very easy to dose and just a few drops are sufficient to reach a high grade of sweetness. 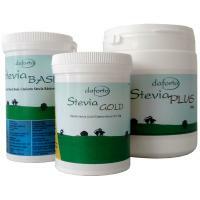 Daforto offers you a set of crystalline stevia products with outstanding high grades of purity of the used stevioside and rebaudioside A. These pure steviol glycoside powders can reach up to a 480-fold sweetness. Moreover, you can find a versatile mixed powder in this section. 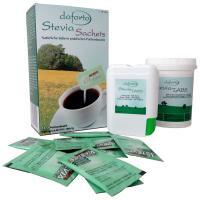 Daforto stevia tablets are as sweet as sugar cubes. They dissolve in liquids, especially when they are warm, and they are delivered in convenient dispensers. Furthermore, we offer the possibilty to buy refill packages which can be used to refill the Daforto dispensers for favourable prices. 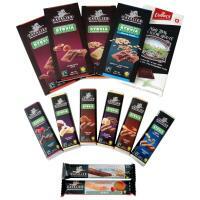 Whitin the "other products" section, you can find all stevia based products which do not fit in the other three product groups and which are not traded as a Daforto brand - for example stevia based chocolate and cacao. The variety of products listed in this section changes from time to time. If you are not interested in purchasing products in the moment, you can search our information database by using the menu at the left side. We hope you enjoy browsing all the sections! A "Sweet-Switch" chocolate bar, type Milk & Hazelnuts, with stevia instead of sugar. With 13% hazelnuts. Cocoa solids: min. 36%.